Malice Domestic is coming up in just a little over two weeks—May 3-5 in Bethesda, Maryland—and one of the things I’m always most excited about each year is the launch of the Malice Domestic anthology. 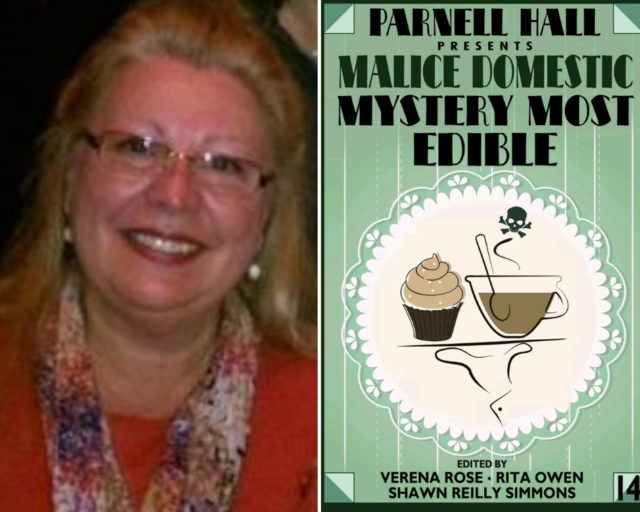 This year’s volume is Mystery Most Edible, edited by Verena Rose, Rita Owen, and Shawn Reilly Simmons and presented by Parnell Hall (this year’s Lifetime Achievement honoree), and it features a wide variety of contributors, as you can see at the anthology’s website here. Seeing Marni’s work in the anthology is a particular joy because (as she mentions in her essay) when she was writing the story, she reached out to me and to Barb Goffman as well for advice and for feedback on the completed draft. As usual (unfortunately!) I ran behind on responding, but when I did read the draft, it was clear that Marni had a winner on her hands—such fun to read and such a thrill when she got her acceptance. I was celebrating right along with her! While Marni may be new to the short story market, she’s already accomplished as a novelist, balancing two series: the Nora Tierney English Mysteries and The Trudy Genova Manhattan Mysteries. Trudy Genova is the detective in “Quiche Alain” as well, and the second book in that series, Death at the Dakota, is due soon. For more information on all Marni’s work, visit her at Auntie M Writes, where she reviews contemporary crime fiction. I still need to hone my short story skills as well. I’ve had two Sherlock Holmes pastiches accepted by MX Books, but each is 10K+. Seeing this made me realize maybe— just maybe—I’d try it again! Many thanks for including me. I’m excited to be among the great writers in this anthology. You’d better! The story was great–first of many, I hope!